Total Beverage Solution, Vino.com, L.L.C. 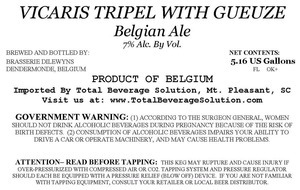 "vicvaris Tripel With Gueuze is imported by Total Beverage Solution, Vino.com, L.L.C. from Belgium. The alcohol content is 7%. This brew is served on tap. We first spotted this label on June 14, 2014.